For Christmas last year, Namine asked for experiences, not presents. My brother and his wife gave her a safari tour; that tour was today. The tour was located at Safari Lake Geneva, a fairly new wildlife preserve for many species of herbivores. The parking lot was a little difficult for Namine, due to the fact that is was fairly loose gravel. The main enclosure, where we could see and pet a number of small goats (and alpacas if they chose to approach us), was also gravel, but it was more firmly packed, and Namine was able to roam on her own. On the topic of goats, there were a couple different kinds. 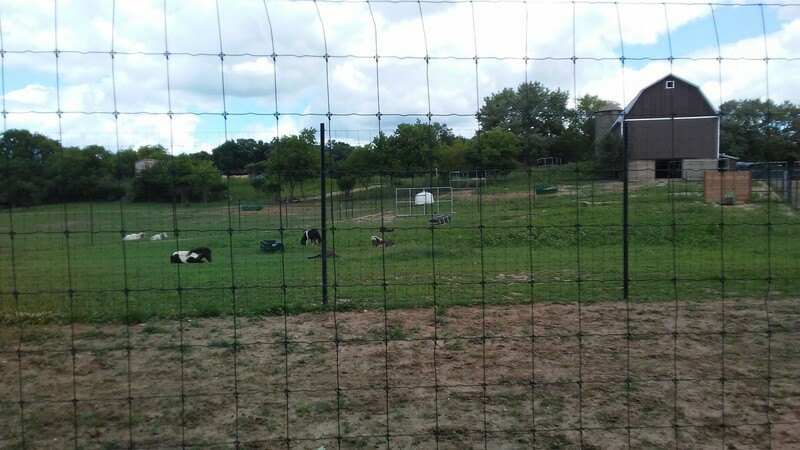 One was of the fainting goat variety (though none fainted in front of us), and the other looked like very small sheep, but for the small horns on their heads. We had arrived roughly a half hour before our tour began, so we had plenty of time to wander, petting and feeding the goats as we pleased. We also saw a tortoise. Long after we’d depleted the animal feed we bought, we continued to be pursued. 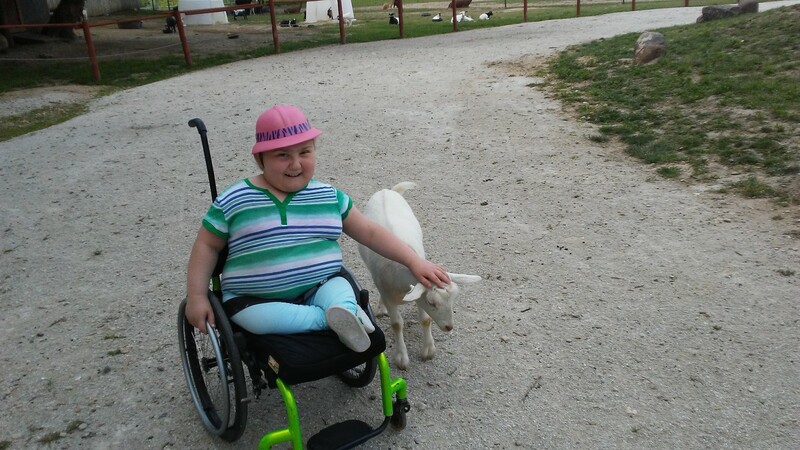 When it was time to board the tractor trailer for our tour, a ramp was provided, so Namine was able to roll her wheelchair on board with no trouble at all. 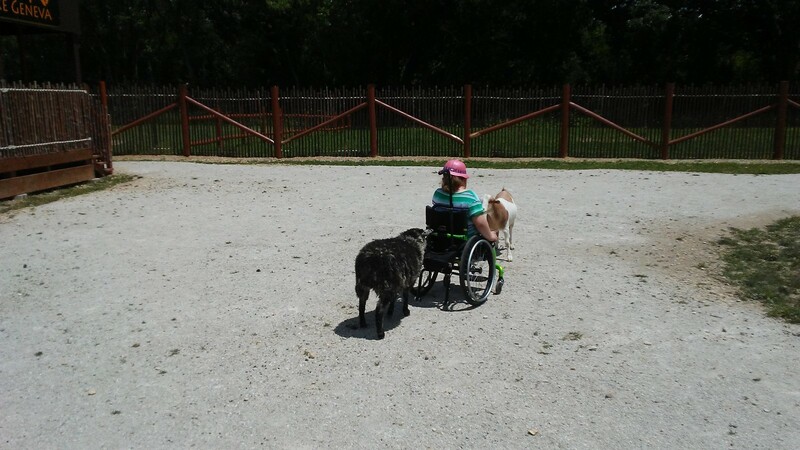 Everyone was quite considerate of Namine, and we got a great spot to sit where Namine could stay in her wheelchair, facing outward, and see the animals. On the tour itself, we saw a great variety of animals: Ankole-Watusi (longhorn) cattle, miniature zebu (humped cattle, and they did not look miniature to me), zebras, alpacas, llamas, horses, Arabian camels, rheas (ostrich-like birds), scimitar-horned oryx, and a couple different species of antelope. There were miniature horses, but we only saw them at a distance. They were separated from the other animals because they had been chasing the baby yaks. We only saw one yak, and it too was pretty far away from the tractor’s well-worn path. The horses were on a time-out. At many points during the tour, we stopped so people could feed the various animals that approached the tractor.